Flavor Text: "There is a kernel of Truth to all myths." Crazy card, needs restriction IMO. Really nice effect for any domain for any fraction, could be neutral, doesn't matter as you never want to pay his normal cost. Yes, I would play him in almost any deck (if not all). Card can be used in many ways in offense and defense. Black Dog is a good card also for rush when used in offensive way. Also Dirk Sharpe should go to every deck which tries to win stories. I'm confused. Does the Action intend to make it easier to put a second copy into play? Surely the Action won't work if the card isn't yet in play? It has a cost of 3, right? Or is the cheap "pay 1" deployment offset by the single-phase temporary deployment, with the cost of 3 being solely to bring the card out into full play? "Pay 1 to put Master of the Myths into play from your hand"
is also quite scary so it's free jumping and killing/stalling era... I really think cost of 1 and no resource match required is too easy to meet. Not broken, but boring and i dont like it. Personally, I would prefer if cards like these would have a faction matching requirement. "Pay 1 Silver Twilight resource" would be just fine, then the cards would remain in the factions they're meant for and not be splashed all over. I think he would be great if the cost was 2, 1 if you have ST card in play. It would be a nice addition to ST and would still be useable for other fractions but not next to free to use. and other cards that have colour but it doesnt really matter. Hmm i wonder how strong a deck build of only such cards and neutrals would be. Probably not too strong but can be fun to play. Okay, Zephyr. I see how Dreamlands Fanatic can be played without a resource match. But why do you class Snow Graves with those others? P.S. Agreeing in principle with Mr. Boeren, I'd say instead of a resource match, that these out-of-phase deployments should only be possible if you already have one or more cards of that faction in play. Snow Graves is a zero-cost card that has no Steadfast icons on it, making it free to splash into any deck. Ah! Zero cost ... no domain drain ... no resource match. Got it. You know, that card is crazy. It ought to at least have a cost of 1. If Master of Myth’’s enters play via its ability, then is driven insane (e.g. by Hanyatl’s 7:13), does it go back to the hand at the end of the turn? Yes. The effect on Master of Myth’s creates a lasting effect that will resolve regardless of whether it is sane or insane, as long as the card is in play. For purposes of triggering Cathouse, does Master's ability count as a triggered ability? The core rules say a triggered ability is just a triggered effect that is in play. Does that mean Master's ability is a character ability and a triggered effect, but not a triggered ability? In other words, does Master pair up with Cathouse? Short answer: Master of Myths and Cathouse don't work together. Ability is a word that is very broadly used, especially in the FAQ, and it appears that it could mean almost any card effect, triggered or otherwise. But, a "triggered ability" is well defined by the core rules and specifically means "any triggered effect caused by a card already in play." The "already" part of that makes if pretty clear to me that the Master Of Myths triggered effect isn't a "triggered ability" at the time it is triggered. The use of "already" appears to be intentionally addressing the situation that some effects bring things into play, and excluding those. Btw, the second bit, where he bounces is a "lasting effect", and thus not even a triggered effect at the point it happens. Note that the "time" when Action-type triggered effects are "triggered" is 1f of the Action Window in Detail (from the FAQ), while the card doesn't actually get into play until the effect resolves in step (3). So Master of Myths definitely isn't in play when his effect is "triggered". So while it's an ability, and it's a triggered effect, in the language of the game, it's not a "triggered ability". Thanks, RP. That last sentence is exactly what I was wondering. Character ability? Yes. Triggered effect? Yes. Triggered ability? No. I was just hoping you'd tell me this was an example of the Golden Rule. Just to clarify, it is not a "character ability", since as RichardPlunkett said, it is not in play. It is a card effect, specifically a triggered effect. The semantics in terms of the mechanics of the game are important in case anyone tries to cancel a "character ability." What RichardPlunkett probably meant was that the text in a textbox of a card in play, whether it has been historically a triggered ability, constant, or keywords, is generally referred to as it's "ability". Danigral, Can you provide a reference for character ability? I had a look, and I struggled to find a definition of "character ability". While I have a tentative association of the word "ability" with cards in play, I don't actually know where I got that from. I mean "triggered ability" is well defined, but I can't find a clear definition of ability, it mostly just seems to mean text on a card - and while I would love it to mean text on an in-play card, I lack evidence. Meanwhile, the FAQ makes several weak references to abilities of cards that are clearly to of play. (eg there is an FAQ question that asks about the Master of Myths enter play ability vs even though he can never be in play when it is used). RichardPlunkett, I spent some time poring through the rules and FAQ and you seem to be right that there is no specific reference to "abilities". There are some references to "ability" when a card is in hand, notably referring to The Thing Behind You. 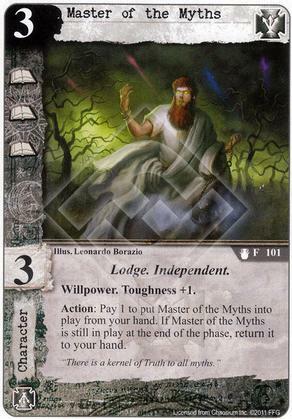 "Ability" has historically been defined in all of FFG's LCGs as the effects on a card in play, but I know that is weak footing to build a proverbial house of cards on. I continue to think that while "ability" refers to those effects, it is not specifically a "character/support ability". This is mostly because of the "in-play" argument, but also because cards in out-of-play states can be argued to have no type. Card effects, according to the rules, interact with cards out-of-play by specifically referring to elements or aspects of those cards. A card then, for example, that would hypothetically cancel a character ability is looking for an effect on a character card. Even if for argument's sake, we suppose that abilities could be effects on cards out-of-play, "the game" does not know that that card is specifically a character until it enters play. Does this mean then that an effect that cancels a "card ability" would be allowable? I'm not sure...to me, it is just cleaner (and logically consistent) to call abilities effects on cards in play, and leave it at that. Others can chime in with their interpretations though.